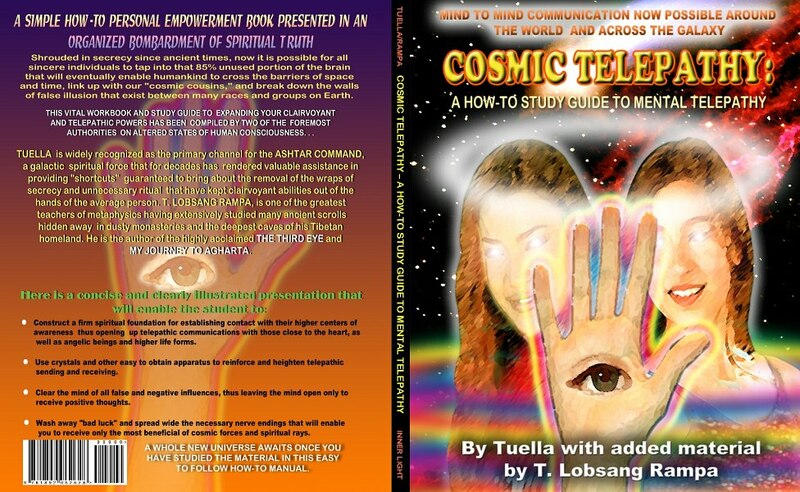 Tuella' s channeled messages for this book reveal that every living thing has an aura, or energy field surrounding it. Though auras are constantly changing and moving, stored within them is everything about that person, from the moment they were born to the present day - all they have experienced, thought and felt. It's all ready to be tapped into.. so long as you know the password. Equally as wonderful is the fact that an individual's energy can remain with everything it ever touches; it can even be captured in a photographic image. 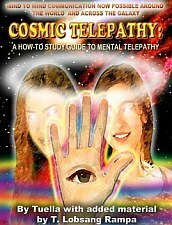 All this through the wonders of cosmic telepathy. 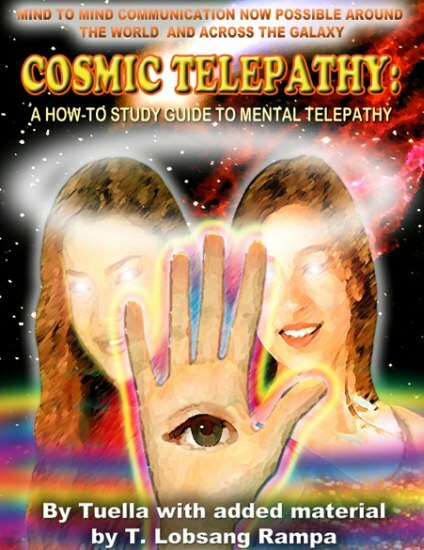 A few of the things that can lower your frequency and keep your cosmic telepathy from flowing properly: heavy, processed, and junk foods; try to eat lightly or not at all before any attempts at cosmic telepathy; negative words, thoughts, actions, and feelings; negative people and situations; artificial synthesized materials such as fluorescent lights, synthetic fabrics, synthetic foods, vitamins and medicines; working at a job you hate; mainstream radio, television, and newspapers - particularly the news. We all have preconceived notions of how things should work out, how our dreams should manifest, what will happen when and how. We have beliefs that outline the only way things can happen, but when we have those outlines in our heads of the way it should happen, we slow it down, and sometimes stop it from happening at all. It's not the circumstances that bring the reality to you. A good job doesn't ensure you 11 be rich, secure and happy in that job. Your resonance determines whether you'll be rich, secure and happy. A good job can be the detail the universe chooses, but so could a great investment paying off that frees you to open your own business,, or a neighbor deciding to live in Europe and asking you to run her business. If you send out a pure energy of prosperity, security, ease, fun, etc. and let the universe decide how it arrives, you are opening every possible door that could bring you this reality. If you have rigid ideas of how and wheitand whether you can have what you want, you are closing the possible avenues of its arrival, one by one. Know you can have everything you desire. Know that it will take time, patience, knowledge, skill and healing to open all the doors of possibility. The universe and your Higher Powers will take care of the details- if you do your part and become crystal clear about how you want it to feel when it arrives. Meditation helps the physical conscious mind connect with the higher or divine consciousness we all have inside ourselves. Through practice and dedication, this "bridging" between our physical and divine selves opens the doors to a new spiritual knowledge that has always existed, but that we may not have been able to "tap" into. People who meditate on a regular basis report feeling the "need" to improve their attitudes or outlooks on life. This could be one of the positive results of bridging the conscious and sub-conscious spiritual minds together. All of this is important for maintaining a positive energy flow for psychic development. The more positive your attitude is, the easier it is to make a connection to the positive forces around you. There are numerous forms of meditation such as Yoga, Tai Chi, mantra, gazing and freeform; these are the most common. No one way is better than another. What works for one person may not work for another, so it's best for people to choose the type of meditation that feels the most comfortable for them. Then one must practice, practice, pradtice. There are dozens of books on the market that describe how to meditate, or if you'd like, take a look at our method of meditation. The important part to any meditation though, is learning how set the energy within, how to protect yourself and align your energies with the higher forces on ethereal planes. Get a notebook and keep track of your experiences, your outlook and so on.